One of the ministers in charge of Zimbabwe's police has told the BBC she is in hiding for fear she would be arrested as part of a state plot. Theresa Makone is from the MDC, which joined President Robert Mugabe and his Zanu-PF party in a unity government in 2009 after years in opposition. She said that Zanu-PF wants to stop her and other MDC MPs voting in next week's election for a speaker of parliament. Tension is again rising in Zimbabwe ahead of possible elections this year. Ms Makone said she had been told that another MP and Lovemore Moyo, the former speaker of parliament, also faced arrest. 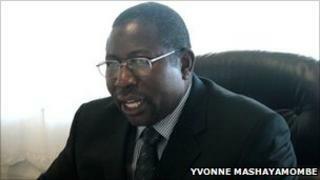 Zimbabwe's Energy Minister Elton Mangoma was earlier arrested for a second time this month. The 2008 election of Mr Moyo as speaker of parliament was nullified by the Supreme Court two weeks ago, following a complaint by a Zanu-PF official, who said the vote was "disorderly". Ms Makone accuses Zanu-PF and their allies in the security forces of trying to prevent MDC MPs from voting, to ensure their candidate wins the new election. "I was sitting in my office signing papers when I received an anonymous call to say that I was going to be arrested today and that it would be advisable for me to leave the office immediately," she told the BBC by telephone. A disused mineshaft. A mass grave. Hurried exhumations. A mood of dread, suspicion, and blistering political rhetoric. This has the makings of a very Zimbabwean murder mystery. For many days, the state-controlled media, loyal to President Robert Mugabe, has been giving saturation coverage to the exhumation of hundreds of bodies from an abandoned mine. She said she believed the call was credible because of Mr Mangoma's detention. He was first arrested on accusations of fraud linked to a fuel deal but is now accused of corruption. The MDC said his initial arrest was politically motivated - it prompted MDC leader, Prime Minister Morgan Tsvangirai, to call for a "divorce" from Mr Mugabe and the unity government. Neither the MDC nor Zanu-PF has a majority in parliament. The balance of power lies with a smaller faction of the MDC and BBC Southern Africa correspondent Karen Allen says its members are being courted by all sides. After the 2008 election, the smaller MDC faction helped Mr Moyo win the election for speaker. Both Mr Mugabe and Mr Tsvangirai have said the unity government is no longer working and called for fresh elections. The MDC had previously insisted that a new constitution must be in place before polls are held, to ensure they are free and fair.